New features include fingerprint scanner, improved camera, and even a heartrate monitor. 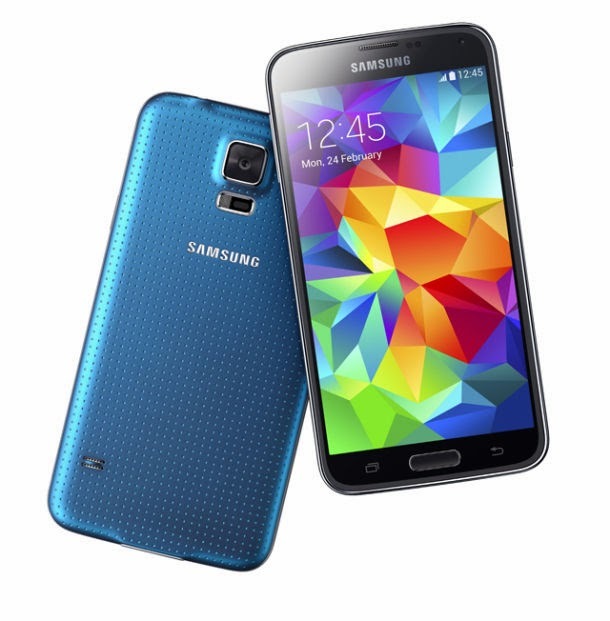 As expected, Samsung has taken the wraps off of its latest flagship smartphone, the Galaxy S5. Announced today at Mobile World Congress in Barcelona, the Samsung Galaxy S5 builds upon last year's Galaxy S4 with improved camera capabilities, a new design, a fingerprint scanner, fitness tracking capabilities, and more. The Galaxy S5 deviates from the plain plastic look of the previous iteration with a new perforated pattern on its back and comes in new "shimmery white, electric blue, and copper gold" color variants. The changes to the design also offers new device protection, including a a dust and water resistant coating and a built-in fingerprint scanner built into the home button for added data security. The screen size has been increased slightly to a 5.1" FHD Super AMOLED 1080p display. The built-in camera sensor has been increased to 16-megapixels — up from the Galaxy S4's 13-megapixel sensor — and boasts the "world's fastest autofocus" of 0.3 seconds. It also comes equipped with faster HDR performance and added depth of field effects. Under the hood, Samsung has added support for the latest Wi-Fi standard, 802.11ac, as well as 2X2 MIMO and expanded LTE support. A Galaxy S5-specific feature called Download Booster leverages both Wi-Fi and LTE to increase transfer speeds. It uses an unspecified 2.5GHz quad-core processor, 2GBs of RAM, and ships with Android 4.4.2 KitKat. The device will be sold in both 16GB and 32GB variants, though storage can be expanded to 128GB via microSD. The battery has been increased from a 2600mAh in the Galaxy S4 to a 2800mAh battery in the Galaxy S5 with an estimated talk time of up to 21 hours. Finally, Samsung is ramping up its fitness tracking efforts with S Health 3.0 — the company's integrated fitness software. Users can track steps taken, record food intake, and even track their heartrate with a built in heartrate monitor. Samsung has designed a touch-enabled heartrate monitor onto to the back of the Galaxy S5. The Galaxy S5 along with Samsung's new Gear Fit wearable will be available in the U.S. on April 11.